Poppies are used as a symbol of remembrance for those who fought and died in war. Drawing: Creating a field of poppies using layering of oil pastels. Painting: Painting techniques including spraying and stamping. 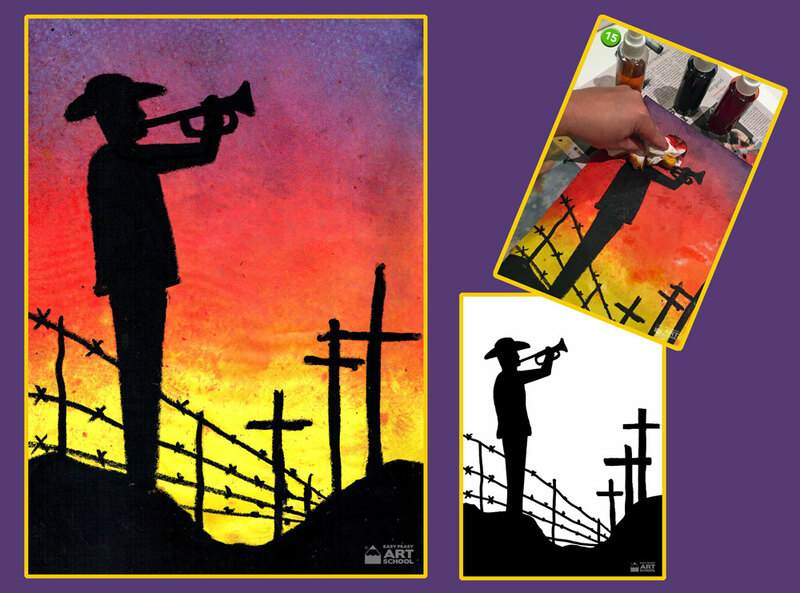 In this artwork we create a simple yet beautiful artwork that symbolises those who fought and died in war. Poppies are used as a symbol of remembrance on both ANZAC day and Remembrance Day. Remembrance day is commemorated each year on the 11th November as this is the day that World War 1 ended. The poppies have come to symbolise Remembrance Day as they grew wild on the battlefields. In this artwork we use oil pastel to create the grass and stems of the poppies and then we use paint to create the petals of the flowers. For a different version of this lesson for older students, why not try creating it portrait style using the famous poem “In Flanders Fields” as a background. See below for a printable template. Vegetable or food dye. We have used blue and purple but the colours are up to you. We have used ‘Edicol dye’ a powdered dye mixed with water designed to be used as paint or as a wash. Paint tray or paper plate. Foam paint stampers. You could also use a fat bristle brush to stamp with if you don’t have the foam version. Newspaper or table covers to protect workspace, both on students desks and in the area where spraying will take place. When stamping the red paint, hold the paper nearby with a couple of fingers. This will stop the paper from lifting up when you lift the stamper. You could also create this artwork portrait style with longer poppies. When spraying, make sure that you do it with adult supervision and in an area where you can clean up easily. Spraying can be a little messy! Don’t hold the spray too close or too far away when stencilling. Keep the spray bottle on a diagonal or upright so that it works properly. Make sure that an adult mixes the dye and water. The dye can stain fingers, clothing and kitchen benches. Use rubber gloves when mixing vegetable dye or you will end up with some very colourful fingers! Mix the dye in a larger container which you can then decant into the smaller spray bottles as you need them. Carefully supervise the students when they are spraying to ensure they are using the correct technique and also so that they are using it safely. To prevent management issues, only have a small number of students spraying at one time while the remainder of the class are engaged with other independent tasks. Place your paper landscape style. Grass: Using one of your green oil pastels, begin drawing the grass as shown. Make sure it touches the bottom of the page. Using your other greens and yellows complete your grass by drawing different length strokes to the bottom of the page. Try and fill most of the spaces. Stems: Using your dark green, draw different length stems for your poppies. Draw tall ones and short ones and try to evenly space them out. Now add some poppy buds. Use your light green to add long and short stems between the dark green ones you just drew. Try and add stems that bend over or even cross some over one another. On top of each light green stem, colour a grape sized oval for the bud. Now add the black centres of the flowers. Draw and colour small black circles on top of the dark green stems. Then draw small dots around each circle. Spraying: Prepare your area for spraying and then begin spraying the blue dye mix over the grass and bottom half of the page. Hold your spray almost upright and approx 20-30cm away from the artwork. Don’t cover the whole page, save some space for your other colour. To complete the spraying, use your purple or second colour to spray over some of the blue and then about another 1/4 of the page. Try to leave a little white space at the top of the page. Carefully soak up any large drops of dye using paper kitchen towel. Stamping: Flatten out your paint into a thin layer on your plate or paint container. If you use too much paint you will end up with big blobs of paint on your poppies. Begin stamping over the black circles. Try to stamp neatly without pushing too hard. If you mess up a petal, just try again. Remember to reload your stamper with more paint after every few petals. You will only need to stamp each poppy with 3 or 4 petals depending on the size of your stamper. After you have stamped all of your poppies, set your artwork aside to dry. Your artwork is now complete. Why not try our Last Post lesson?